RIP Bo. You were an Angel here are Earth and I’m sure God has a high place in Heaven for people like you. Bo Johnson, a brave young man, who despite his own illness, got up out of his hospital bed, and came to comfort my daughter in her time of need, a little girl he had never met, yet could hear crying out in agony in the middle of the night. Bo passed away last night at about 3AM. God bless you and keep you Bo. Please join me in sending love and peace to Bo’s Mom Annika who has lost her only child. And please comfort all of Bo’s family and friends. It feels trivial to write about the little things going on in our lives right now, but I know you are also anxious to hear what has been happening. It’s strange operating in these two worlds; cancer-land and ‘real-life’. I sometimes feel like I have my feet on two different islands. I’m towering above them like a giant, but also held down and cemented into the earth, arms outstretched to find balance, trudging slowly forward to form steps. I no longer feel that my worlds are colliding … nor are they merging. They are coexisting. After Lulu’s heart tests, we are relieved that her heart is healthy and strong. Her hernia will need surgery, but the docs want to wait 18 months until she is finished with her therapy, to lessen the risks. Luckily, the hernia doesn’t bother her at all. Unless that changes, she should be fine to wait. My hernia turned out to be something I can wait on as well. Apparently, I was experiencing searing nerve pain from the irritated hernia. It has since subsided, much to my relief. No mother-daughter hernia specials needed yet. Lulu has been exhibiting some new behaviors that we looking into. She’s started to show tendencies towards OCD. It’s not diagnosed or labeled, just something we are going to address sooner than later so that it doesn’t turn into something more serious. It’s certainly understandable, under the circumstances. Children have very little control over their worlds at age 5, and throw in the year she’s had filled with upheaval, stress and uncertainty, and these symptoms can develop. It’s her way of controlling SOMETHING. Even if it’s where we stand, how we kiss and hug her goodbye, wave out the window just so, and say exactly what she needs us to say before we leave. It’s become more and more apparent that the family as a whole has had to act around these behaviors. We are going to learn how to parent under these circumstances, how to give her a sense of control, and help her feel secure in her world as much as possible. She’s still doing very well in school, and this has not impeded her lifestyle day to day. We are confident it will just be a matter of time before these rituals dissipate. Again, these problems feel small right now, in light of the news on Bo. Please keep Annika and their whole community in your prayers. The ripple effect Bo has had on so many is nothing short of astonishing. Thousands of people will be mourning today, but also lifted up by this wise young man. On Monday, August 27, Bo Johnson chose to come home to die. For nearly a year he battled valiantly against an extremely rare, extremely aggressive form of Extramedullary Acute Myeloid Leukemia, also known as EM AML (read “Bo’s Battle,” for more). That Sunday, his doctors told him there was nothing more they could do for him – that he will die from his disease. Bo didn’t want to die in the hospital. Bo wanted to come home. Bo Johnson, shortly after he shaved his head during chemotherapy treatments for Acute Myeloid Leukemia. The 13-year-old Sister Bay boy with the humble smile has called the HOT Unit (Hemotology, Oncology, and Transplant) at Children’s Hospital of Wisconsin in Milwaukee his home for most of the last year. His battle began with a Labor Day jet-ski accident and a broken pelvis that wouldn’t heal. On Oct. 8, 2011 doctors discovered he had Acute Myeloid Leukemia (AML), and within days he was prepping for chemotherapy. By the time he started treatment, his schoolmates had painted northern Door County orange – the color of the ribbon to show support for leukemia patients. They made orange GO BO! ribbons, wrist-bands, t-shirts. They bought orange shoes and orange shoelaces. They painted orange ribbons on their cheeks and GO BO! on everything they could find. Bo recognized right away that he was lucky. He had his mother Annika at his side, friends begging to visit, cards pouring in, and Facebook and Caring Bridge pages blowing up with messages from friends, family, and strangers. The Gibraltar Cross Country team showed their support for Bo Johnson at a meet Aug. 29, wearing orange ribbons and painting GO BO! on their calves. photo by Joy Manweiler. But on his floor in the hospital he saw other kids suffering, some of them seemingly alone. Many would become his friends, his mentors, his teammates in the fight against terrible odds. Jack Bartosz was one of those who taught him how to fight. The nine-year-old battled neuroblastoma for seven years, and his “I Back Jack” campaign raises funds to support research for new treatments. But there’s a heartbreaking risk in making friends in the HOT unit. Jack died the day Bo got the news that there was nothing more they could do for him. In the face of such trauma, Bo struggled to remain positive where others could not. Did he ever want to do that? He says that every note, every card, every ribbon helped him answer the bell each day. The flash mob at Fall Fest, the GO BO! group photos at the school and the Sister Bay Bays game. The notes and updates on his Facebook page and the school assembly when Dr. Phil Arnold talked to the students about his disease. The candlelight vigil in Sister Bay’s Marina Park turned into a video by Chris Miller for Bo to see. A single orange ribbon waved from the Gibraltar School sign the day Bo Johnson returned home to Sister Bay. By the next day, orange ribbons waved from nearly every Northern Door sign, mailbox, and tree. Instagram photo by Myles Dannhausen Jr.
Learning that he had cancer was a shock, of course, but he says it wasn’t the worst moment in his ordeal. He says this from his bed, his feet sticking out from beneath a Wisconsin Badgers blanket. His hands are too weak to shake, so when family friend Doug Bensyl arrives, Bo opts for a fist bump instead. It is futile to try to imagine what it must be like for a boy who loves baseball, basketball, and football, to be confined to his bed, his body slaughtered by this disease. It is more futile still to try to comprehend how his spirit remains so strong. 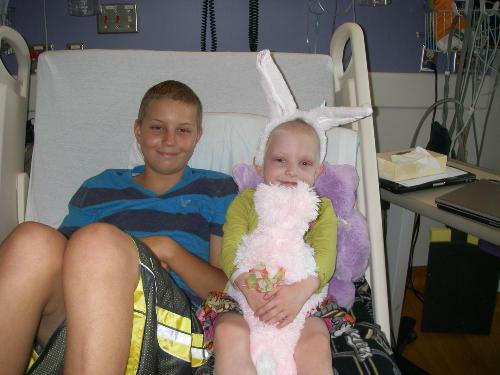 There was a time Bo and Annika thought they had beaten his leukemia. He came home last February, his chemo complete. He returned to school on a limited schedule, put on 20 pounds, and was on his way to recovery. They took a trip to Florida together, and when they returned Bo went to a Cal Ripken baseball practice and even ran the mile, beating his goal of eight minutes by two seconds. Then he joined his classmates on the annual trip to Washington D.C. in late April. Near the end of the trip his arm swelled. Bo was inspired by 9-year-old Jack Bartosz, who he met in the HOT unit of Wisconsin Children’s Hospital. Jack died Aug. 27 after battling neuroblastoma for seven years. Photo by Annika Johnson. photo by Annika Johnson. 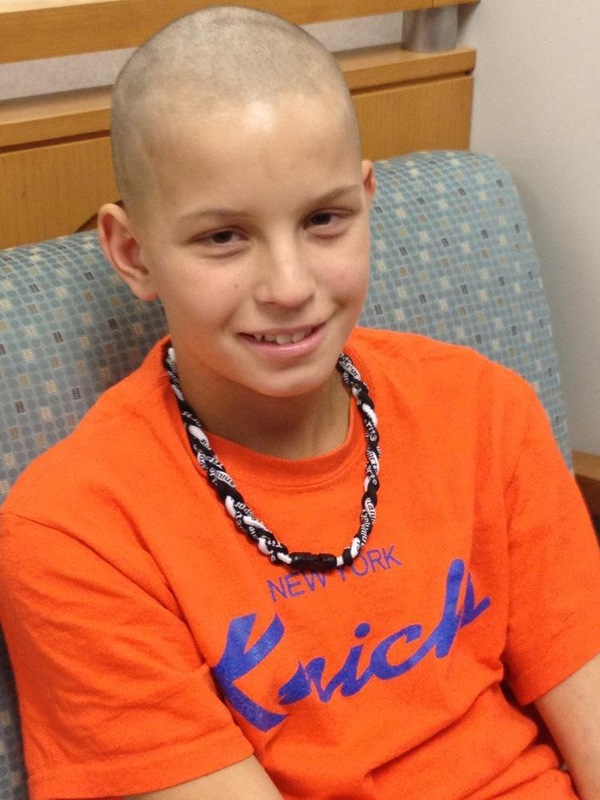 On May 3, Bo’s 13th birthday, they learned that his leukemia was back. This time chemo was not an option. He needed a bone marrow transplant (also referred to as a stem cell transplant). They always knew this was a possibility. It’s not uncommon for an AML patient to relapse in the first year after treatment. They prepped for the transplant, but on June 21, Dr. David Margolis, the program director for blood and marrow transplant at the Children’s Hospital of Wisconsin, entered Bo’s room and delivered news they couldn’t possibly be prepared for. This is when they learned Bo had Extramedullary AML, meaning that the cancer doesn’t confine itself to the bone marrow, but attacks the bones throughout his body. That’s why it kept coming back, why Bo couldn’t get healthy. The chemotherapy was successful in fighting the AML, but chemo doesn’t kill the EM AML. “Is this rare?” Annika asked him, through tears. “Dr. Margolis practically fell off his chair and on top of Bo’s bed,” Annika remembers. Bo’s schoolmates have shown their support in every way they can – ribbons, fundraisers, t-shirts, even special team shoes. photo by Paula Hedeen. They learned that his chance of beating the EM AML were extremely low, perhaps as low as three percent. It was the most difficult moment of Bo’s ordeal. Annika thought they were talking about the wrong boy. She couldn’t talk; she could only cry. His best option was Total Body Irradiation (TBI). It is not pleasant, and for the first time, his doctors gave him the option of palliative care. On his second night home from the hospital Bo’s friends showed up to take him to one of his favorite “hot spots,” the Sister Bay beach. Pictured (left to right): Casey Weddig, Connor Brennan, Quinn Jacobs, Ian Chomeau, Seth Johnson, Andrew Iding, Ernie Erickson, Ava Erickson, Hannah Helm, Kara Caldecott, Shannon Martin, Adele Steebs, Mariah Davis and Bo Johnson (center). Photo by Chandra Johnson. Annika left the decision to Bo. He had been through so much already. She had watched him writhe, heard him scream, in pain. It was up to him to go through it again. Bo chose to put the gloves back on, to go another round against a disease that had him by every measure – a foot taller, a hundred pounds, an arm’s length. He would take its devastating blows one more time, in hopes of sneaking in one lucky punch. Dr. Margolis told Bo that he had to be 100 percent sure that he could do it. That he couldn’t make any excuses, play possum for the nurses, which he was so good at, or beg out of walking laps around the floor. He gave Bo a motto. “Just do it,” he told him, and he drew a swoosh on the white board of his door. The TBI decimated his tissue. He suffered from mucositis, which left him with open sores on his tongue, throat, and intestines that felt like shards of glass were slicing through his body. For four weeks he couldn’t eat. The only thing he could swallow were the Cyclosporin pills to help his new stem cells grow. The pills were “three big horse pills,” Annika says, and Bo had to take painkillers just to swallow them. When Bo chose to come home, his only regret was leaving his “second family” behind. The nurses at Children’s Hospital were incredibly personal, he says, helping him through every difficult day. “It’s hard to be away from the hospital because you feel so safe there,” he says. Annika has a great deal of respect for Dr. Margolis. He didn’t shield Bo from reality through this process, didn’t sugarcoat any news. In fact, he reminds Annika of a stubborn old Swede she knew. “Dr. Margolis doesn’t hold back, he spits it out. He reminds me of my Dad,” she says, referring to her late father, the restaurateur Al Johnson. The GO BO! ribbon has become a ubiquitous presence in Northern Door County. Last week Dr. Margolis delivered the hardest truth. “Bo is going to die from this,” he told them. Dr. Margolis asked Bo what he wanted to do. “I don’t want to die in the hospital,” replied Bo, who in a world without cruelty would instead be choosing a new pair of shoes for the coming school year, not where he wanted to die. Bo does not cry as he says this. He says it almost bluntly, as if it’s patently obvious. He is surrounded now by about a dozen of his friends, part of the growing stream that are coming to see him. He is happy to be with them, they are happy just to have him back, asking when they can take him to the beach, the favorite of the “hot spots” he wanted to get back to see. She never expected the tables to turn. Now they lie in his bed and he puts his arm around his mother. He tells her that he’s not scared, that she’s going to be okay. Bo spent a lot of time over the last year thinking about what he would do if he could get healthy again. He thought of becoming a nurse, to pay forward what his nurses have done for him. This summer he came to grips with the idea he might not make it that long. That evening his friends wheeled him down to the pier where they used to leap into the bay. The next night he made it to Gibraltar’s varsity football game. “He wouldn’t stop talking about it!” Annika says. She wants to take him to the first Packers game Sunday. More than anything, Bo says he hopes that the support and love that his friends and community showed for him will not dissipate when he is gone. His mind turned to the small gifts that meant so much to him. Bo Johnson with his mother Annika. At the end of our conversation we talk about one of those small gestures, the orange ribbons that sprouted up on signs, trees, and telephone poles when the community learned Bo was coming home. He talks about what the outpouring of support has meant to him, what his friends have meant to him. Now, he wants people to remember him, but he wants them to continue supporting others the same way. After he got the news that there was nothing more the doctors could do for him, Bo gave his mother a mission. On Monday, August 27, Annika announced that Bo was coming home to die. She had it wrong. On Wednesday, August 30, Bo Johnson came home to Sister Bay to teach us how to live.